Orion Fans has developed a line of dual-voltage AC fans designed for electronic equipment and industrial enclosures. Designated the OA109AP-11/22 Series, the 120mm x 38mm fans can be configured to operate on 115V or 230V. The family of fans is constructed from diecast aluminum and all have UL94V-0 glass fiber reinforced thermoplastic impellers. 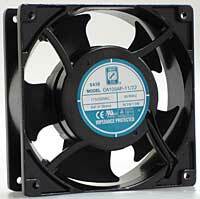 Fans are available in sizes from 17mm to 280mm. A wide range of fan accessories is available, including finger guards, fan cords and cordsets.